OS X Mavericks Transformation Pack is the first transformation pack system from Windows XP, Vista, Windows 7 or Windows 8, all supported to taste the latest Apple Mac OS X Mavericks appearance. According to the developer, the transformation pack includes the Mavericks / iOS 7 wallpapers, user pictures, icons, sounds, cursors, startup screen, similar to the OS X dock and Launchpad issues. The installer package includes UxStyle Core transformation that automatically edits the original system files to add support to visual aspects of system, without giving many rodeos. In simple words, no need to download or modify or run OS X Mavericks Transformation Pack around to convert our Windows to Mac OS X Mavericks. 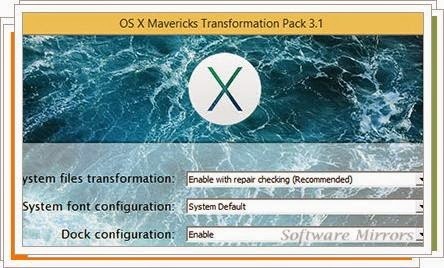 As the installation file OS X Mavericks Transformation Pack is similar with other transformation pack that allow us to decide which elements you want to install or modify. Once you have installed the transformation pack, you are prompted to reboot the system to apply the changes. OS X Mavericks Transformation Pack can be safely uninstalled from "Control Panel" or by rerunning the installer. However, since the first version appeared and to avoid problems, we recommend creating a restore point in case something goes wrong and some items are not removed completely.